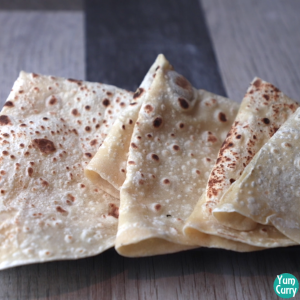 Rumali roti is kind of Indian flat bread. It is one of the popular breads in Indian. Rumali roti is prepared with combination of wheat and all purpose flour, the technique of making it seems tricky but once you hang on it, you can make these wonderful breads easily. 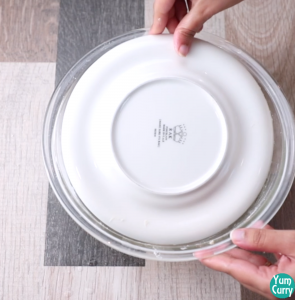 In this recipe I will show you how to make rumali roti step by step with photos. Rumali roti is famous for its preparation technique and for its thin and soft texture. Rumal means handkerchief and this bread is thin and soft like a piece of cloth so it is served folded like handkerchief thats why we call it rumali roti. It is an art to make rumali roti, and one needs a lot of practice to make it like professional chef. 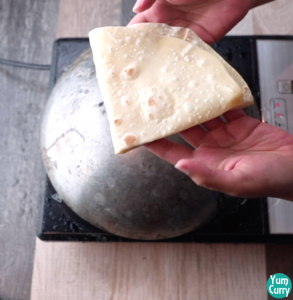 This traditional dish is originated from Mughlai cuisine and It’s soft and mouth melting texture goes with any Indian curry, but you don’t find them in every restaurants like you find other Indian breads like, tandoori roti, chapati, missi roti and paratha, may be because of technique of making it. I remember, I first had my rumali roti in a wedding party, these rotis are popular and feature in most of the wedding celebration. It so fascinating to see chefs or cooks when they prepare rumali roti. These big breads are not made on rolling board or using rolling pin, they are stretched by using hands in a way that it turns into big roti. To give them big size, first breads are stretched to a certain size and then tossed in the air many times, to give the desired size. Traditionally rumali roti are not cooked on tawa or pan as these breads are very big and needs to be cooked on very high heat so generally tandoor is used to make these, but at home we can make these by placing roti on the inverted kadhai. 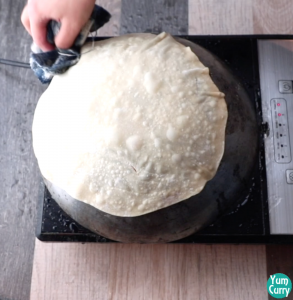 When I first saw chef preparing rumali roti, by tossing in the air and with such a big size I though it is just impossible to make it at home, I tried it first time but did not get the perfect texture. After practicing 2-3 times, I would not say it turned out perfectly as roomali roti restaurant style, but comes out thin and soft. 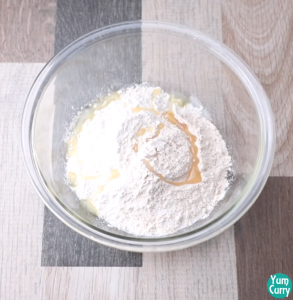 How to make rumali roti? So if you are bored with same roti or chapati, give a little twist by making these wonderful Indian flat bread. You do not need any special ingredient to make rumali roti, traditionally it is prepared with all purpose flour dough and to roll it chef just toss it in the air. 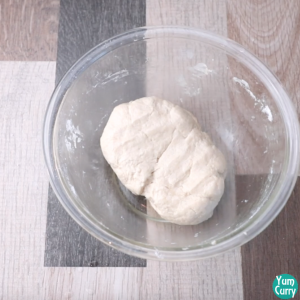 For making rumali roti we need a very soft dough, so it can be stretch easily as much as possible, I am not that proficient in make it by tossing in the air so adding some wheat flour, it will help to roll it easily. First roll the dough to the 7-8 inch diameter circle and swing it and gently stretch by holding edges of the circle. Repeat the same process for stretching bread from the all the side. Bread should be as thin so that you can partially see through it. 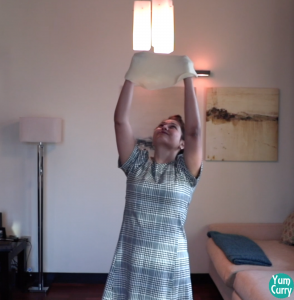 Then toss it in the air, and carefully catch on the knuckles, if you try to catch it on fingers you end up having holes in your bread, I am tossing it just for having feel and fun, you can simply roll and stretch it with your hands. 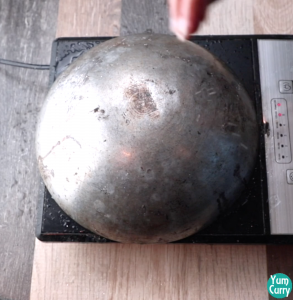 It is recommended to cook it on inverted (convex side) aluminium or iron kadhai. If you do not have one, you can simply cook it on tawa just like chapati. If using aluminium or iron kadhai keep salt water ready and sprinkle it on surface of kadhai, it will prevent bread to stick on surface. 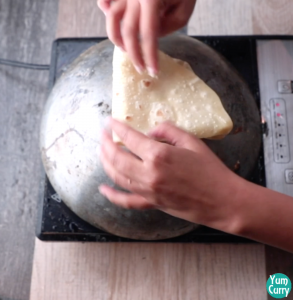 To make rumali roti dough should be kneaded very soft, so we can easily roll chapati. 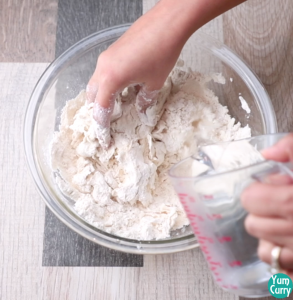 Mixing wheat flour in the dough help to rolling bread easily. 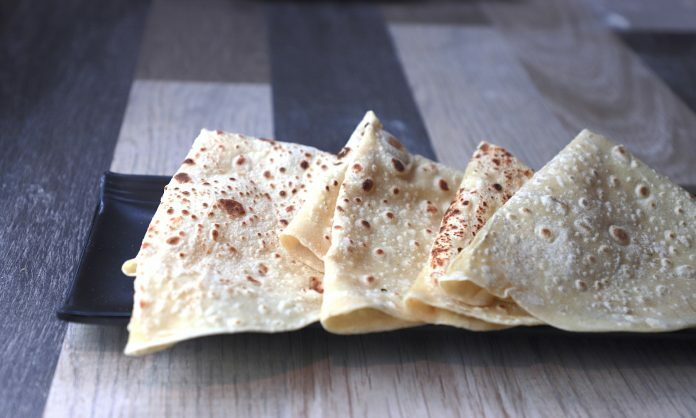 stretch roti as thin as possible almost like a handkerchief. Salt water prevent from sticking bread to the kadhai surface. I am tossing it just for feel and fun, you can simply roll and stretch it with your hands. Traditionally Rumali roti cooked only one side because it is cooked on very hot surface. As our cooking surface is not hot as tandoor we have to cook it from the both side. If you do not have aluminium or iron khadhai, simply cook it on tawa same like a chapati. Immediately after taking out from kadhai keep it inside muslin cloth or kitchen towel to protect it from turning hard. 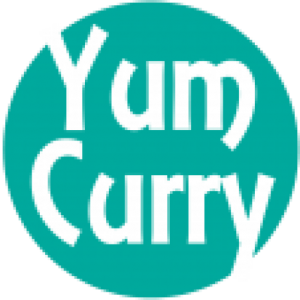 You can enjoy these mouth melting breads with matar paneer, chicken tikka masala, paneer tikka masala, paneer butter masala, shahi paneer, malai kofta. I prepared more indian flat breads like garlic naan, tandoori paratha, lachha paratha, click on the name to get full recipe. 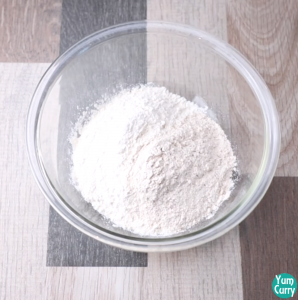 Add 2 cups of all purpose flour and 1/2 cup of wheat flour in a mixing bowl. Add salt and 1 tbsp oil in the mixture, mix all ingredient well. 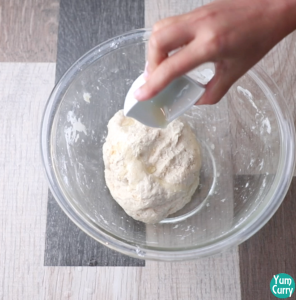 Add little water at a time to knead a soft dough. Apply some oil on the dough, cover and let it rest for 10 minutes. 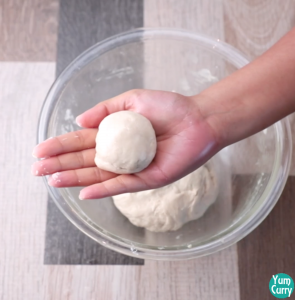 Take a portion from the dough, roll between your palm and gently flatten it. 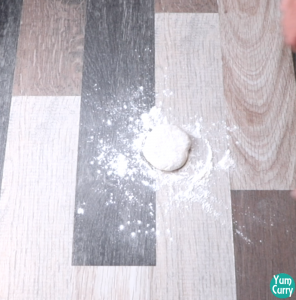 Dust some flour on rolling board and coat dough ball with plenty of flour. Start rolling it, roll the dough ball in to a circle(5-6inch diameter). Hold it from edges and gently start stretching. You can also toss in the air like I did and carefully catch the dough on the knuckles (or on the back of your fists), if you catch it with your finger you will end up puncturing it. 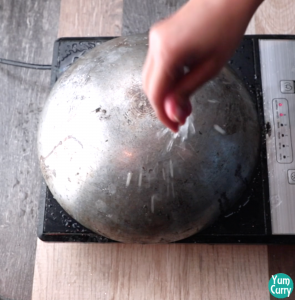 sprinkle some salt water and gently place flatten dough on to the surface (to make salt water take 1/2 cup of water and dissolve 1 tbsp salt in it.). 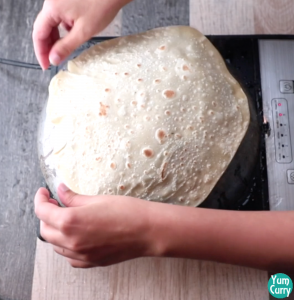 Slightly press it with folded cotton napkin, when you start seeing small bubbles on roti flip it to the other side. Again press it with folded napkin. Do not cook it for long time. When it is cooked, pickup from edges and fold it like a hanky. Keep it covered so they can stay soft. Rumali roti is ready, you can have these wonderful roti's with any indian curry. Hold it from edges and gently start stretching it. Hot a aluminium kadhai keep it up side down (convex side). sprinkle some salt water and gently place flatten dough on to the surface. 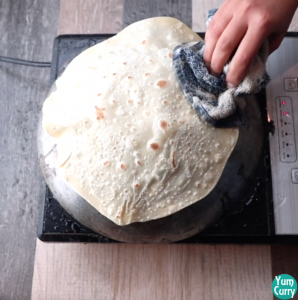 Slightly press it with folded cotton napkin, when you start seeing small bubbles on roti flip it to other side. Again press it with folded napkin. Do not cook it for a long time. Rumali roti is ready, you can have these wonderful roti’s with any indian curry. If you like and follow this recipe to prepare Rumali roti. Please come back and let us know in comment section how it turned out.